Wednesday, January 23, 1833.New Salem, IL. Friday, January 23, 1835.Vandalia, IL. Lincoln votes to reconsider resolution concerning Bank of U.S. and national currency. Committee of which Lincoln is member reports act to simplify legal debt collections. Report and amendments are referred to Judiciary Committee.House Journal. Monday, January 23, 1837.Vandalia, IL. Lincoln, Dawson, and McCormick of Sangamon are appointed select committee to take up road petition. Discussion begins on internal improvement bill. Lincoln votes yea on $50,000 appropriation for improvement of Big Muddy; $320,000 to build railroad from Bloomington to Pekin, and nay on submitting improvement bill to people.House Journal. Wednesday, January 23, 1839.Vandalia, IL. Several members wishing to change vote on resolutions of yesterday, House considers requesting Senate to return resolutions. Motion is lost 51 to 38, Lincoln and other Sangamon Whigs voting nay. He votes yea on bill incorporating Charleston Marine and Fire Insurance Co.House Journal. Thursday, January 23, 1840.Springfield, IL. Lincoln favors issuing scrip to continue work on canal. He explains that people near canal also favor it and are willing to run risk. He helps table resolution authorizing suit against signers of bond executed in Springfield to obtain state house. (See March 22, 1838. )House Journal. Saturday, January 23, 1841.Springfield, IL. Lincoln writes to his law partner Congressman John T. Stuart and discusses Stuart's possible bid for re-election. 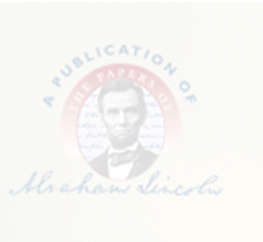 In the second half of the letter, Lincoln reveals that he is suffereing an intense bout of depression as he writes, "I am now the most miserable man living. If what I feel were equally distributed to the whole human family, there would not be one cheerful face on the earth. Whether I shall ever be better I can not tell; I awfully forebode I shall not. To remain as I am is impossible; I must die or be better, it appears to me." Abraham Lincoln to John T. Stuart, 23 January 1841, CW, 1:229-30. Tuesday, January 23, 1844.Springfield, IL. Spear v. Campbell & Dabney (SC), bill in chancery to set aside alleged fraudulent conveyance, appealed from Sangamon County, is argued by Robbins for plaintiff and Logan & Lincoln for defendant.Record. Thursday, January 23, 1845.Springfield, IL. Favor & Palmer v. Marlett, is argued by Dickey and Lincoln for plaintiff and Peters for defendant. Lincoln and Dickey win when court reverses lower court judgment. Record; 6 Ill. 385. Lincoln writes and signs petition for rehearing and reply to assignment of errors in Patterson et ux. v. Edwards et ux.. Herndon-Weik Collection, Library of Congress, Washington, DC. Friday, January 23, 1846.Springfield, IL. Lincoln wins Ross et al. v. Nesbitt, argued January 20, 1846, when judgment of lower court is affirmed. Justice Koerner delivers opinion of court.Record; 7 Ill. 252. Saturday, January 23, 1847.Springfield, IL. Lincoln writes and signs motion to admit lower court record in Thomas Cowls v. Ann Cowls, appeal from Edwards County Circuit Court involving support of divorced wife and children. Herndon-Weik Collection, Library of Congress, Washington, DC. Tuesday, January 23, 1849.Washington, DC. In House amendment to civil and diplomatic appropriations bill to allow congressmen ten cents per mile for mileage, and $2,000 per annum in lieu of per diem expenses and all other allowances, is defeated, 36-150. Lincoln votes with majority. Globe. Lincoln writes to Henry E. Dummer of Beardstown, relating results of Post Office chore performed for this old friend and colleague. Abraham Lincoln to Henry E. Dummer, [23? January 1849], CW, 2:24. Thursday, January 23, 1851.Springfield, IL. Illinois Central bill is reported to Senate, with amendments. Senate Journal. Sunday, January 23, 1853.Springfield, IL. Lincoln attends temperance lecture by Rev. James Smith, D.D., pastor of First Presbyterian Church. Abraham Lincoln to James Smith, 24 January 1853, CW, 2:188. Monday, January 23, 1854.Springfield, IL. Tuesday, January 23, 1855.Springfield, IL. Travel to and from Springfield is still impossible. Lincoln buys overshoes, small shawl, and for his wife two combs and cotton flannel. Pratt, Personal Finances, 147. Friday, January 23, 1857.Springfield, IL. Mr. and Mrs. Ninian W. Edwards give large party, which Mr. and Mrs. Lincoln probably attend. Browning, Diary. "Son" brings home "½ lb. Tea @ 1.25." Pratt, Personal Finances, 148. Wednesday, January 23, 1861.Springfield, IL. John G. Nicolay, private secretary to President-elect, writes Gen. Edwin C. Wilson on Lincoln's instructions, expressing satisfaction at assurance that militia of Pennsylvania is ready to come to support of Union "in the event of trouble or danger." Nicolay to Wilson, 23 January 1861, John G. Nicolay Papers, Library of Congress, Washington, DC. Francis P. Blair, Jr., Congressman-elect (Mo. ), visits Springfield to press claim of his brother Montgomery to cabinet appointment. Blair says: "The day of compromise is gone, and the day of fighting come." Harry J. Carman and Reinhard H. Luthin, Lincoln and the Patronage (New York: Columbia University Press, 1943), 38; N.Y. Herald, 24 January 1861. Dr. Gilt of Virginia calls on Lincoln on behalf of Cassius M. Clay, Kentucky abolitionist, and Judge John C. Underwood, Virginia unionist, relative to cabinet posts. Blair to Blair, 24 January 1861, Gist-Blair Family Papers, Library of Congress, Washington, DC. Lincoln deposits $165.10 in Springfield Marine Bank. Pratt, Personal Finances, 164. Waits in vain at station for arrival of Mrs. Lincoln and their eldest son Robert on night train from east. Villard, Eve of '61, 54-55. Thursday, January 23, 1862.Washington, DC. President confers with Lt. Henry A. Wise (USN), Navy Bureau of Ordnance, regarding mortars under construction at Pittsburgh. Abraham Lincoln to Andrew H. Foote, [23 January 1862], CW, 5:108. Consults with Gen. Lane and Sen. Samuel C. Pomeroy (Kans.) regarding fugitive slaves and concludes that government cannot return them. N.Y. Tribune, 24 January 1862. Nominates John Tucker of Pennsylvania and Peter H. Watson of Washington, DC, to be assistant secretaries of war. National Intelligencer, 25 January 1862. Interviews Senator Lazarus W. Powell (Ky.) regarding military assessments to provide for persons made homeless. Powell to Lincoln, 29 January 1862, Abraham Lincoln Papers, Library of Congress, Washington, DC. In the evening, President Lincoln and his wife, Mary, attend the Washington Theatre to watch the New York Academy of Music perform selections from two Italian operas—Giuseppe Verdi's Il Trovatore and Vincenzo Bellini's I Puritani. A newspaper reports, "The President and Mrs. Lincoln were present, and on his appearance in one of the private boxes he was greeted with hearty applause." Evening Star (Washington, DC), 23 January 1862, 2:1, 5; 24 January 1862, 2:1. Addresses memorandum to heads of departments and bureaus: "This man wants to work—so uncommon a want that I think it ought to be gratified. I shall be obliged by any Head of of [sic] a Bureau, or Department who can and will find work for him." Abraham Lincoln to Heads of Departments and Bureaus, 23 January 1862, CW, 5:109. Friday, January 23, 1863.Washington, DC. Meets with Cabinet, except Secretary of War Edwin M. Stanton. Daily National Republican (Washington, DC), 23 January 1863, 2d ed., 2:4. President interviews Mrs. John Green who asks promotion for husband. Memorandum: Promotion of John Green, 23 January 1863, CW, 6:76. Mrs. Col. Kingsbury calls on Lincoln and asks that John J. D. Kingsbury be appointed to West Point. Memorandum: Appointment of John J. D. Kingsbury, 23 January 1863, CW, 6:75-76. President wishes secretary of war to arrange for Gen. Butler to start for New Orleans by February 1, 1863. "I think we can not longer dispense with Gen. Butler's service." Abraham Lincoln to Edwin M. Stanton, 23 January 1863, CW, 6:76-77. Transmits to Congress report regarding regulations pertaining to U.S. consular courts in Turkey. Abraham Lincoln to the Senate and House of Representatives, 23 January 1863, CW, 6:76. Saturday, January 23, 1864.Washington, DC. Lincoln answers inquiry of Alpheus Lewis, cotton trader, regarding cases wherein owners of plantations might recognize freedom of slaves and hire them to cultivate land: "I should regard such cases with great favor, and should, as the principle, treat them precisely as I would treat the same number of free white people in the same relation and condition." Abraham Lincoln to Alpheus Lewis, 23 January 1864, CW, 7:145-46. Issues permit to Christopher F. Clay and Christopher F. Field, son and brother-in-law respectively of Cong. Clay (Ky.), to put their plantations into cultivation under system of free hired labor and protection of military authority of U.S. Permit to Christopher F. Field and Christopher F. Clay, [23? January] 1864, CW, 7:146-47. Transmits to Senate papers relative to modification of treaty with China. Abraham Lincoln to the Senate, 23 January 1864, CW, 7:147-48. Earlier in the week, purchases a box at Grover's Theatre for benefit performance tonight of Tom Taylor's The Ticket-of-Leave Man, for the benefit of the Ladies' Soldiers' Relief Association. Daily National Republican (Washington, DC), 22 January 1864, 2d ed., 2:4; 23 January 1864, 2d ed., 2:6. Renomination of Lincoln unanimously recommended by Union Central Committee of New York. Hardenbrook to Dana, 23 January 1864, Abraham Lincoln Papers, Library of Congress, Washington, DC. "Mrs. Lincoln's reception this afternoon was attended by an immense throng of citizens and sojourners here." Evening Star (Washington, DC), 23 January 1864, 2d ed., 2:4. Monday, January 23, 1865.Washington, DC. President spends day reviewing courtmartial cases (45) and military arrests. Abraham Lincoln to Christopher C. Augur, 23 January 1865, CW, 8:232; Abraham Lincoln to Joseph Holt, 23 January 1865, CW, 8:233; Abraham Lincoln to Joseph Holt, 23 January 1865, CW, 8:233; Order Concerning John Dugan and Christopher V. Hogan, 23 January 1865, CW, 8:233-34; Abraham Lincoln to Edwin M. Stanton, 23 January 1865, CW, 8:234; CW, 8:577. Telegraphs W. O. Bartlett at New York: "Please come and see me at once." Abraham Lincoln to William O. Bartlett, 23 January 1865, CW, 8:232. In the evening holds reception at the Executive Mansion, which was "one of the finest that has taken place at the White House." Daily National Republican (Washington, DC), 24 January 1865, 3d ed., 2:6; Evening Star Washington, DC), 24 January 1865, 2d ed., 2:5.